Past Student Essays from City Honors College Preparatory. THINK. TANK. CHALLENGE – Who thinks about credit at age 15? Think. Tank. Challenge. – Growing up, most kids do not think about money. Why would they? Think. Tank. Challenge. – Financial literacy is both is blessing and a curse. THINK.TANK.CHALLENGE – Growing up in school I was never taught financial literacy and how to manage my money as an adult. 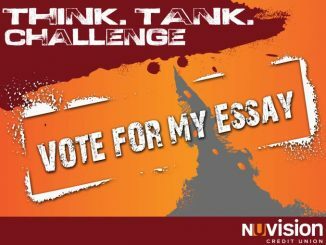 NuVision 2017 Essay Challenge – The Think.Tank.Challenge has provided a great amount of useful information, but how we, as students, will carry this out will be the question.